Hi there friends! 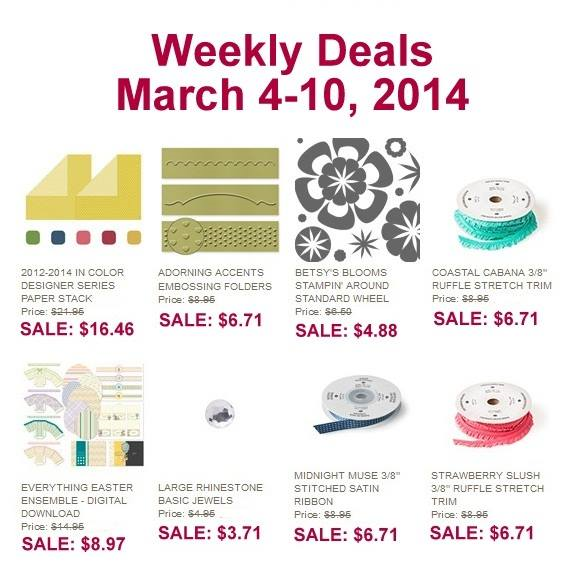 Here are the Weekly Deals good through Monday March 10th at midnight. I am putting in an order Monday night by 8 pm, email or call me if you need anything. OR go to my online store, shop in your pajamas, and use Hostess Code: GPQC3CWG and your order will ship directly to you. Remember I do a monthly contest for all online orders, and pull a winner at the end of the month. February’s winner was Andrea F. thanks so much, I emailed you with gift certificate information (good off class fee, retired items sale or new product). Thanks for stopping by, Happy Friday!